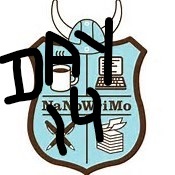 Well, it’s obvious I skipped out on Day 13 of NaNoWriMo, but I’m here on Day 14 and feeling slightly better rested. I picked up my computer today and wrote 750 words, to bring my total word count to 20,538. Of course if you’re on track with you’re word count you should be somewhere in the vicinity of 23.333 give or take. For the past two days I’ve been trying to rest both my fingers and my eyes. I know I’ve touched on the fact I’ve different maladies which forgo my ability to write on occasion. One is arthritis, practically everywhere but worse in my fingers. Another is dry eyes. “Ha” you say? Dry eyes? Unfortunately it causes my eyes to go blurry when I look at my computer screen for any length of time. It even makes it difficult to drive or just to read. Thus the need to rest the poor things. And why am I mentioning these maladies of mine? Because for those of you out there who may have similar problems I’m reminding you it’s ok to take that day or two off from writing (even during NaNo) to take care of yourself. I think I’ve mentioned it before. Remember when you suffer, your writing sufferers as well. So, I have a bit of my day left to relax. I’ve made it to my 20,000 word goal, for the moment. Now I’ll finish my day of rest. Keep taking care of yourselves and keep those pens and keyboards going.